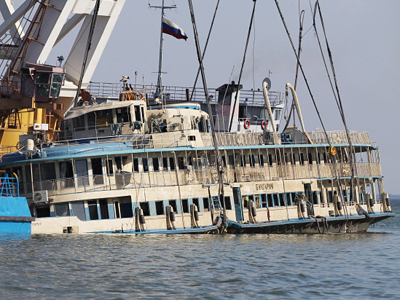 ‘Cruise-by salute’: What happened to Costa Concordia? 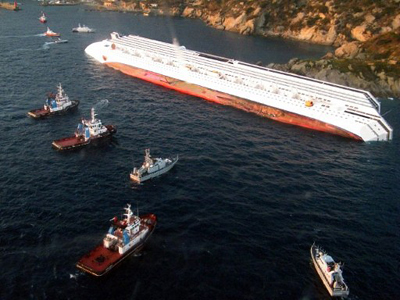 The captain of the Costa Concordia is accused of “human error” over the cruise liner crash which claimed six lives. Some media suggest he was sailing far too close to land to salute to a friend on the island of Giglio. Italy is ready to declare a state of emergency over the Costa Concordia disaster according to the country’s environment minister. The cruise liner has shifted dangerously on Monday, raising concerns that the 2,300 tons of fuel on the half-submerged ship may leak. "The environmental risk for the island of Giglio is very, very high," Corrado Clini said, as cited by Reuters. "The aim is to prevent the fuel leaking out of the ship. We are working to avoid this. It is urgent and time is running out." Costa Chairman and CEO Pier Luigi Foschi told a press conference Monday that Costa Crocier, the owner of the stricken vessel, has blamed the tragedy on “human error” by the captain, saying he made “an unapproved, unauthorized maneuver” to change ship's course. “The route of the vessel appears to have been too close to the shore, and in handling the emergency the captain appears not to have followed standard Costa procedures,” the statement says. Meanwhile, attention focused on Captain Francesco Schettino's behavior. The captain is under close investigation as he faces accusations he abandoned the vessel before ensuring all of the 4,200 people aboard were safely evacuated. 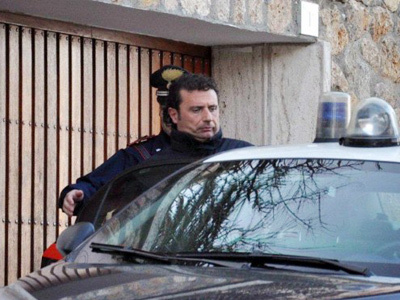 Shortly after the accident Schettino was arrested at the request of the Italian prosecutors. Other possible reasons which could have led to the deadly cruise liner crash have been also voiced. Another possibility is that the water level near the island of Giglio turned out to be unexpectedly low. Technical error was also listed among possible causes. But the vessel’s owner stated that the liner had passed all safety and technical tests in its 2011 evaluation, dismissing the possibility. Police continue to investigate why the accident happened in calm conditions, just a few hundred meters from Giglio. The death toll has risen to six people after a man’s body was found in a corridor in the part of the ship that was still above water. On Monday morning investigators also identified the bodies of two men found on the stricken Italian cruise ship as an Italian and Spanish citizens. A total of 64 people were injured in the accident, health authorities said. Fifteen people, passengers and crew members, are still missing. Meanwhile, rescue operations stopped after the ship began sliding into the sea. Luca Cari, a firefighters spokesman, said rescuers evacuated the vessel after a slippage of 9cm vertically and 1.5 cm horizontally was noticed. 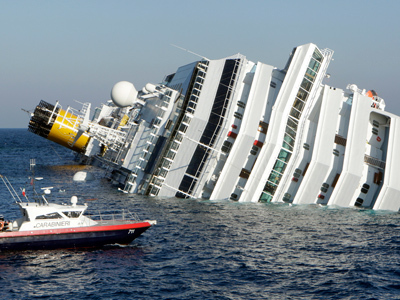 Passengers of the Costa Concordia accuse the crew of being unprofessional and unable to conduct proper rescue operation. Witnesses said that it took almost two hours to start the evacuation. Many complained the crew did not provide them with good directions on how to evacuate. "We were left to ourselves," ANSA news agency quoted pregnant French passenger Isabelle Mougin. However, other passengers say the vessel’s crew was helpful and informed the passengers during the whole rescue operation. The Costa Concordia cruise ship carrying some 4,200 people hit a reef off the Italian coast on Friday evening. Over 4,000 people, including 3,200 passengers, were immediately evacuated to safety. Take a look at our gallery with photos from the scene of the wreck.